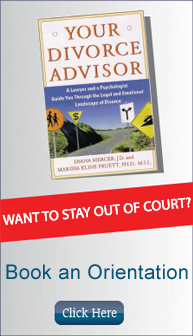 Why would therapists refer a case to divorce mediation or custody mediation? Divorce Mediation and Custody Mediation are sane, sensible alternatives to litigation for Couples who are divorcing and unmarried, separated parents with children. As a therapist, you know that all too often separating Couples focus on the scorched earth of the conflict rather than on the solutions that might help them move on with their lives. Attorneys are trained to focus on the product of the divorce—the legal paperwork and financial settlement. They aren’t trained to help clients negotiate the emotional process of getting divorced or settling custody—and the court doesn’t have the time or resources to help clients gain true closure on the emotional issues. While many clients choose mediation at the outset of their case, mediation can start at any time during (or after) the divorce process. Did we mention that it’s also less expensive, typically 1/3 to 1/10 the cost of litigation? It’s also more effective because the ultimate agreement is tailored to the clients’ individual situation, and because the clients participate in each decision in a thoughtful, informed way, mediated agreements also have a higher rate of adherence and lower rate of future litigation. Click here for a more thorough list of pros and cons, and click here for a comparison of the costs. At Peace Talks Mediation Services, Inc., we team therapist-mediators with attorney-mediators in a co-mediation setting to help clients move through both the product and the process of the divorce at the same time. We feel that a therapist and a lawyer working together provide the fullest view possible of the divorce process. While divorce mediation is a product-oriented service, e.g., clients need an agreement and appropriate court paperwork to finalize their divorce with the court, it’s just as much, if not more, of a process-oriented service, i.e., the psychological divorce. Using both types of professionals, we feel we help clients navigate both sides of the issues. Even with the slightly higher fees, many clients find that they resolve their cases faster and more thoroughly than if just or a lawyer or just a therapist mediated with them alone. Our understanding of divorce as both a traumatizing and re-traumatizing event is influenced by the work of therapist Leonore Terr, Ph.D. and high conflict divorce researcher, Janet Johnston, Ph.D. Divorce often reopens an earlier wound, whether it’s from a previous divorce, a difficult childhood, a poor example from one’s own parents, other misfortunes, abandonment and losses or combination of these elements. Impasses often result from unresolved emotional issues. As much as the parties may need their legal divorce, without paying appropriate attention to the psychological right-brain divorce a suitable, longstanding agreement is unlikely. By working together, we can make sure the clients have the right paperwork and that their legal bases have been covered while also making sure that they’ve had an opportunity to process the emotional divorce issues.